All works composed by Renee Rosnes. ‘Written in the Rocks’ puts Rosnes up there as one of the most in-flux, fluid, fantastic artists around. The title track features gorgeous interweaving lines between Rosnes and Nelson before Rosnes plays a flowing solo that is overwhelming in its sheer beauty…Let this mark the beginning of a new series of albums featuring this outstanding composer and musician. An exceptional achievement…’Written in the Rocks’ establishes – or reinforces – that Rosnes is a virtuoso jazz composer…this is as good as writing can get in this setting. If I wanted to be a great writer, I would make a deal with the devil to be able to tell a story the way Renee Rosnes does when she sits at the piano. Great artists take on great themes. Duke Ellington dealt with race relations in his three-movement suite, Black, Brown and Beige. John Coltrane meditated on the divine in his album, A Love Supreme. Billy Strayhorn confronted mortality in his deathbed composition, “Blood Count.” And with this project, the culmination of more than several years’ work, Renee Rosnes has tackled nothing less than the very origins of life on Earth. Written in the Rocks is a work of extraordinary creative and intellectual ambition. Renee Rosnes, a pianist and composer esteemed for the rigorous inventiveness of her music, has had a deep love of the natural world since her childhood in western Canada. Over the course of her professional career, she had made clear her fascination with science and ideas, as well as matters of the heart and the soul. Written in the Rocks brings together her varied interests, united through her equally varied gifts. “I’ve always felt inspired by nature,” Rosnes recalls. “Growing up on the mountainous west coast of Canada close to the ocean, I took for granted that the wilderness was so accessible. The infinite blue-green hues of the Pacific Northwest are in my blood. In Written in the Rocks, Rosnes explores the arabesque history of life forms on this planet, from the emergence of single-cell microbes in the sea through the asteroid impact that obliterated the dinosaurs to the wonders of the Galapagos Islands that stirred Charles Darwin to discern how evolution explains it all. The title of the work refers poetically to the geological record of history buried deep below the earth’s crust. Literally speaking, Rosnes has created a whole new kind of “rock” music. It is only fitting that Rosnes employ the idiom of music — jazz, in particular — to treat the evolutionary history that Darwin brought to light, since Darwin himself had great affection for music and drew inspiration from it in his science. As a student at Cambridge, Darwin timed his constitutional strolls to coincide with the daily choral singing at the King’s College Chapel. “This gave me intense pleasure,” he would later recall, “so that my backbone would sometimes shiver.” After his marriage, his wife Emma would serenade him on the piano as he did his reading and writing. “Music arouses in us various emotions,” wrote Darwin in The Descent of Man. “It awakens the gentler feelings of tenderness and love, which readily pass into devotion. 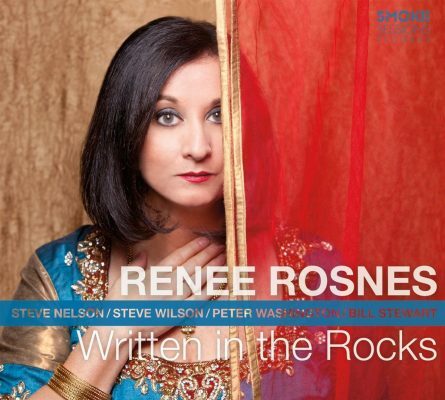 If only Darwin could have heard the music of Renee Rosnes! He would have found, as listeners of Written in the Rocks will find, that there’s nothing common about it. Among the gifts that make Rosnes rare among contemporary artists is her appreciation of love as something unrestricted to amore or eros. She loves ideas and science and nature, as well as her husband and her family; and, as this deeply felt piece of work demonstrates, she loves music for its profound capacities. “To compose music about our planet’s evolution was a stimulating concept and one brimming with musical possibilities,” Rosnes explains. The initial idea for the project grew out of conversations she had with her longtime friend Dino Rosati, a Canadian technology specialist who shares Rosnes’ interest in evolutionary science and astronomy. Rosati wrote a short page of text about the phenomena at the center of each of the suite’s seven movements, and Rosnes used this writing as starting points to compose the instrumental pieces that comprise the work. “The time was 65 million years ago…” begins the text Dino Rosati wrote for Renee Rosnes, describing the day in the dinosaur age when “a rock the size of a mountain” crashed into the earth, destroying more than half the life on the planet. The sediment record marks the point, known in science as the KT Boundary (for the technical abbreviations for the Cretaceous and the Tertiary ages). Rosnes begins the suite with this musical prologue, employing the theme of duality in a duet that expands both instrumentally and in harmonic complexity over the course of the movement. Thus, from the war of nature, from famine and death, the most exalted object of which we are capable of conceiving, namely, the production of the higher animals directly follows. There is grandeur in this view of life, with its several powers, having been originally breathed into a few forms or into one; and that, whilst this planet has gone cycling on according to the fixed law of gravity, from so simple a beginning endless forms most beautiful and most wonderful have been, and are being, evolved. She lived about 3.2 million years ago and resurfaced to make news around the world in 1974, when she was discovered in the soil of the Afar Triangle region of Ethiopia and identified as the oldest known specimen of humankind’s early ancestors. Ethiopians called her Dinknesh — “the marvelous one” — and paleoanthropologists named her Lucy. Renee Rosnes locates this movement of the suite in a triangle, musically, by setting it in 3/4 time, employing a quarter-note motif to evoke the image of Lucy rising to walk on two legs. The piece concludes with bass and drums, leaving listeners with the sound of rhythm, the primordial music. “Life rose up from the rocks beneath the sea, driven by the relentless heat and chemistry of tectonic rifts in the sea floor,” wrote Dino Rosati for Renee Rosnes. “It learned to swim through the waters, to walk upon the land, and to fly through the air. It learned to touch and see and hear the music of the spheres. It left behind fossilized clues to this epic evolutionary story, written in the rocks.” Enigmatic but indelible, messages from the past lay waiting for us to read. In this movement, Rosnes offer up a haunting melody that lingers in the mind through the duration of the suite and long after its final notes have played. How did life migrate from the sea to the shore? An evolutionary biologist named Neil Shubin, a professor at the University of Chicago, was chipping at rocks in the Canadian arctic, searching through the ancient evidence, when he found the fossilized remains of a previously unknown species — a creature that appeared to fill the blank between fish and amphibian life. Granted the privilege of naming the species, he turned to his Inuit hosts, and the elders dubbed it Tiktaalik. Renee Rosnes deftly suggests the ocean and the land in the melody and the counter-melody of this piece, a movement in the suite that brings to mind the Tiktaalik’s movement from one world to another. After some three billion years of little evolutionary change, with life on earth restricted to single-cell organisms, things started happening, and everything changed. Over a short period of 600 million years (short being a relative term in planetary history), the biological framework for trees and fauna and insects and birds and animals took form in an eruption of life forms in seemingly endless varieties known as the Cambrian Explosion. Renee Rosnes ends this suite with a musical parallel to the Cambrian event — an elusive, fast-moving melody that builds to a climax in collective improvisation. Renee Rosnes wraps up this album about the history of life with a song pertaining to her own origins. In a set of events that inspired her 1996 album Ancestors, Rosnes discovered in her adulthood that she was of Punjabi heritage. She met her biological mother for the first time in 1994, just two months before the death of her adoptive mother. “Needless to say, it was both a heady and painful time for me.” Nineteen years later, she visited India and performed there for the first time. “It was enlightening to experience being in India,” she recalls. This piece, a virtuosic bebop tune with an ethereal hint of Indian influence, brings to mind the complexity of cultural forces that underlie Rosnes’ distinctive creative identity today. David Hajdu is the music critic for The Nation, a professor at Columbia University and the author of Lush Life: A Biography of Billy Strayhorn, among other books.